Sadly, they do need to play to the neighborhood a bit so there's an overabundance of Yellow Tail and Barefoot but, that said, there are some absolute hidden gems there as well. And isn't that a sign of a really lovely place? Not to mention that the two women who run the shop are sweetness personified. One of the little touches I love is that, without fail, they use a razor and shave the price sticker off every bottle, as if they think I'm always off to some fabulous dinner party where the price sticker on the wine would be utterly tacky. Likewise, they always offer to chill any white or bubbly wine I might have...because I might want to sip it as soon as I get to my destination. It's this attention to detail that keeps me going back. To make sure you're all up to speed before I start my story, I want to make sure that you know I'm a former children's librarian*. You all know that, right? If not, you do now. What is blanc de blancs, you ask? Well, I'm still learning but my understanding is that it is Champagne made with 100% Chardonnay grapes (as opposed to Champagne-champagne, which is made with 75% red grapes)**. Did you know that traditional Champagne is made with mostly red grapes? Neither did I! So I picked out this bottle of Paul de Coste blanc de blancs, blindly. I asked the woman at the counter if she recommended it and I received an emphatic "yes". Well, she was right. It was sublime: super-dry and very food-friendly. And it cost a fraction of what a bottle of Veuve Clicquot would cost. I loved it so much that I've been hanging on to the bottle for two months to help me remember to buy another bottle! 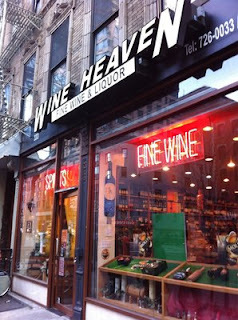 Fast forward to yesterday afternoon and I stopped by Wine Heaven for a replenishment of supplies. While I was buying one of my go-to bottles (Kris Pinot Grigio), I asked about the blanc de blancs. The trouble was that I couldn't remember the name! Only that it was a blanc de blancs! The two purveyors couldn't remember the bottle I was talking about. I said, "No problem. I have the bottle at home, and I'll just come back later with the name." Then I laughed and said, "I can describe the label, though! I just can't remember the name! It's a black label with gold lettering. No graphics or prettiness." Sure enough, they said, "The Paul de Coste!" I replied, "YES!" And then was denied because they were out for the moment. Those of you librarians who read my blog, you know what I'm talking about: "I can't remember the title or author, but I remember that the cover was blue and it was about a dog. And I read it about 20 years ago." And we have to figure out what the heck they're talking about. And I realized I did the same thing to Wine Heaven! Blessedly, I remembered that it was a blanc de blancs, which is way more detail than we normally get in a library. So I raise a glass to all you wine shop owners and librarians: I salute you! * I feel odd referring to myself as a "former librarian". While I don't work in a library anymore, I do subscribe to the idea that "once a librarian, always a librarian". ** Here's my source: thanks, Bon Appétit!